QUESTION: Why not “do it myself”? The value and convenience of the “In A Pikle” bag is amazing! Dollar for dollar, putting together your own kit, with similar must-haves, will cost you much more. And you’ll spend more time doing it. To round-up most of the essentials in our kits, you’re looking at a 2-3 store shopping trip. Who has time for that? We have gathered the most important things so you don’t have to go on a hunt! Our kits are full of emergency essentials! Our kits contain a ton of miniature (and TSA-compliant*) products that you simply can’t find at your local drugstore. And if you can find them, they must be bought in large quantities. Since they’re small enough to take anywhere, you’ll be sure to have one when you need it. Most important, the “In A Pikle” bag is uniquely designed to help you get to those importantly little items quickly. Our amazing clear bags allow you to see the item you’re after. The “In A Pikle” bags are easy to keep clean and did we mention… they are darling!! With 4 designs and 8 colors we are sure you will find a bag that fits your style. Secondly, the “In A Pikle” product is legally protected. Any reproduction or copy for any purpose without permission of “In A Pikle” will be pursued legally. So, let us help you. You’re busy, and your calendar is overrun with birthdays, baby showers, weddings, graduations, and assorted events. The “In A Pikle” bags are the perfect gift for a wide variety of occasions… weddings, back to school, birthdays, and holidays. They are functional, fashionable, and fabulous! Pick your favorite look, pass it on to the person in your life who needs it, step back, and watch them thank you over and over for your perfect gift! *All items in the original Starter Pak are TSA-compliant. Items sold in additional Pak’s may not be TSA-compliant. QUESTION: How can I be a wholesaler? 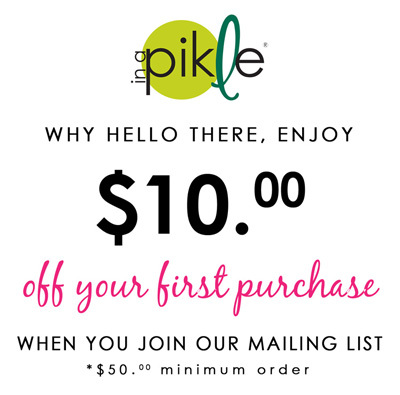 ANSWER: At this time “In A Pikle” does not offer wholesale accounts, but we are considering it in the future. Reach out to us and let us know you are interested through our Wholesale Inquiry form. QUESTION: What is the best way to “pak” my new Pikle? FYI: The clear interior bags were created to withstand various weather conditions, and with repeated use in mind. The material used to create these bags is strong and in some situations, may “form” to the position left in for a lengthy amount of time. There is a simple solution for these bags to return to their original shape…a small amount of heat. Remove all contents and lay your bags out flat. Move the zip lock top back and forth until the original shape returns. Heat the bags until they are pliable. Mother Nature’s Sunshine and/or a warm hairdryer work like a charm! QUESTION: How does my Pikle and/or Bundle come packaged? ANSWER: The “In A Pikle” bag comes with cover and 4 clear interior pouches and is the perfect gift! For this reason, it comes packaged with a set of instructions on “How to Pak Your Pikle.” Although the “In A Pikle” bag and interior pouches (without the Starter Pak & wristlet) would also make a great gift, most customers who purchase this product do so with the intent to fill it with their own contents and customize it for their use. For this reason, this product comes packaged with the interior pouches in a protective plastic pouch inside a standard shipping envelope. This packaging also allows our customers to take advantage of a lower shipping charge as indicated on our shipping chart. The “Bundle” product arrives in a branded Pillow Box with a flyer that describes the many ways it can be used. From time to time we may adjust our packaging to best suit our customers’ needs. ANSWER: Each Pikle/Bundle is customized by you. We have some many covers to choose from along with ala carte items to make each one unique.